By now, many people know to avoid scrubs and shower gels which include plastic microbeads; either look for a natural alternative or forgo cosmetic products with “scrubbing” functions altogether. Simple enough — but what people don’t realize is that many cosmetic products aside from scrubs, even those with names, pictures, or packaging that insinuate naturalness or health, contain various forms of plastics. Ingredients such as polyacrylate, polyurethane, or styrene acrylates copolymer are used as thickening agents, film formation agents, or simply for pigmentation. Plastic ingredients are included in most mainstream personal care products — anything from waterproof mascara, lipstick, and sunscreen to shower gel is likely to contain at least one form of plastic. This fact is largely unrecognized by well-intentioned consumers, who avoid products containing plastic microbeads only to purchase products containing polymethyl methacrylate or polypropylene components. This is worrisome because not only is there a large knowledge gap as to how plastics behave once they reach inside our bodies (as a result of either absorption or accidental ingestion), but at the end of the day, plastic ingredients from these products are washed off and go down the drain, into the oceans. 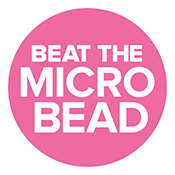 That’s where Beat the Microbead’s “Look for the Zero” quality mark comes in; brands that have been awarded this badge can prove that none of their products contain any form of plastic ingredient; this goes beyond just microbeads to encompass a comprehensive list of plastic ingredients and extends to a brand’s whole range of products for sale. Below are a few examples of brands that are certified with the “Look for the Zero”. When you buy products from these brands, you can rest assured that any item you choose will not contain any plastic ingredients whatsoever. Weleda, founded by a Dutch gynecologist and an Austrian gynecologist in the 1920s, is the first example of a “Zero” brand — it is also the largest that currently sports the badge. Its range of products covers everything from shampoos to body lotions to baby care products — and not one of them contains microplastic beads or any other plastic-based ingredient. Weleda serves as an example to other large multinational companies such as Unilever, Johnson & Johnson, and L’Oreal, all of which have not discovered the benefits of eliminating plastics in personal care products. The same is true for Botanique, a smaller brand that is nonetheless stocked in the major organic supermarket chain Ekoplaza. Urtekram, Green People, and 54 more brands are also proud achievers of the “Zero” — you can find them here. Recommendations for products include Botanique’s lemongrass shower and bath gel, Odylique’s microplastic-free Organic Mineral Lipsticks, Auromére’s Ayurvedic Shampoo Bar, and Trilogy’s Exfoliating Body Balm. As a consumer, one of the surest ways to guarantee that the products you purchase are not processed with any microplastics is to support brands which have the “Look for the Zero” mark. Until plastic-free care products are the norm industry-wide, looking for the “Zero” is your best bet!